We just got back from scuba diving Bonaire. Now I know why it is consistently rated as one of the top diving destinations in the Caribbean. For whatever reason, we had never been diving in Bonaire before. As you can tell from this website, we have dove alot of places in the Caribbean, but somehow we never made it to Bonaire. I am glad that has changed. 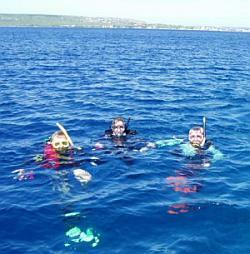 We had a wonderful time and did alot of great diving. Bonaire diving is all about shore diving. You can't beat the freedom of having all those dive sites a short swim from shore. 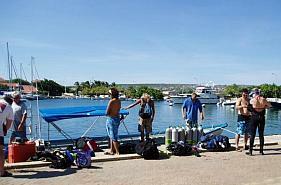 We also did some boat dives but what makes scuba diving Bonaire stand out is the quantity and quality of shore diving. 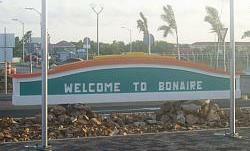 (For more information on Bonaire, see our other pages at the end of this article). We were just glad to get there. First, with all the airlines cutting back schedules, our flight was canceled a few weeks before we were scheduled to leave. All four of us were flying American Airlines on frequent flyer miles and only one of us received any notification of the cancellation. And that was just an email showing an itinerary from NYC to San Juan and back to NY. No mention of Bonaire. Minor details I guess. After many phone calls, we finally managed to change our flights. If you have any upcoming flights, I would suggest to periodically check in and make sure nothing has changed. Next we had to get through the hurricanes. While Bonaire is located below the hurricane belt, we had to fly through it to get there. Hurricane Ike was working its way up the east coast and 2 other hurricanes were brewing in the Caribbean. Long story short, luck was with us and we made it down without incident and had pretty smooth flights. We arrived at about 9:30 at night on American Eagle. Since it was a small plane, getting through immigration and getting our luggage was pretty much a breeze. Since I had heard lots of nightmare stories about luggage getting lost on the way to Bonaire, we packed our clothes, regulators, masks, fins and snorkel in a carry on bag. The rest of our dive equipment (BC's, fins, etc.) was checked. No one in our group had any problem getting their luggage. We rented our pickup truck from Budget which is located right outside the terminal on the left hand side of the parking lot. Two of us waited for the luggage and two went to get the truck and we were ready to go. We stayed at Sanddollar Condominiums in a 3 bedroom apartment. Checking in was a breeze. We had preordered some beer/food to be delivered when we got there, but it was not to be. They never received our order. Oh well. I had meant to call to make sure they got the order but I never got around to it. I suggest you call ahead if you do the same. We made our way down to the Sunset Bar and Grill which is right next door on the water. It's on the bottom floor of the Den Laman Condo's and is now run by the same owner of the Lion's Den Restaurant (located at Buddy Dive). They had a bar menu and we split a couple of appetizers which were good but not great. The waitstaff was very nice and attentive and kept the restaurant open later than usual to accommodate us. Since it is offseason, the restaurant never seemed busy during the week. Hopefully, it picks up for them when prime time comes. The best feature of our condo was definitely the deck. We had a huge wraparound porch with tables, chairs and 6 lounge chairs. We spent lots of time and many happy hours watching beautiful sunsets on that porch. The unit itself was OK, if in pretty bad need of paint job. 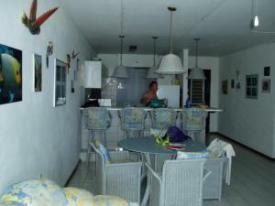 The biggest downfall was no a/c in the main kitchen/living room area. I hadn't noticed that the description had said "a/c bedrooms". So take note. It cooled off a bit during the week since we left the bedroom a/c on with the doors open to cool down the living area and make it liveable. The dive vacation package we had included the 3 bedroom condo, 4 door pickup truck, unlimited diving, 6 boat dives and breakfast. 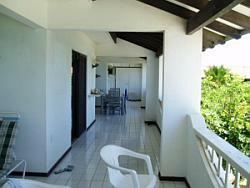 The price for 4 of us in a 3 bedroom condo was $4,070 or a little over $1,000 pp for 8 nights/9 days. Not bad for scuba diving Bonaire. We dove with the in-house dive shop - Bonaire Dive & Adventure. The first morning you have to attend a mandatory orientation session regarding diving and the marine park. You also have to pay a $25 fee for the park and to get your park tags to attach to your BC (the marine park police did come by and check we had our tags during one of our shore dives). The operation was well run and we had no major problems. During our 5 boat dives (we skipped the last one and did more shore diving instead) we had 4 good divemasters and 1 bad one. The bad divemaster seemed to be pretty new and paid not one iota of attention to any of the divers, did not point anything out and did not explain boat procedures. That is fine but please don't expect a tip. And from what I could see, he didn't receive any. We tipped the rest of the divemasters $5/tank per person. The main drawback, which was out of the control of the divestaff, was that the dock was being worked on while we were there (to be completed on October 15). While you could use the dock to do shore diving, the dive boats couldn't dock there. That meant we had to take a short shuttle ride to the the Harbour Village Marina to get the diveboat. All the tanks, gear and divers were shuttled over in 2 vehicles. Obviously that added on to the time spent and was a bit of a pain, but what can you do? We made the best of it. The dive boats were a mixed bag. Two of the boats were small and were crowded when there was a full load. They do have a new bigger boat which was very nice. We were on that for 2 of our boat dives and it was much more comfortable. Entries were backroll and the ladders were easy to use to get back on the boat. I advise bringing your own water since the water on the boat was in a 5 gallon (or so) jug. You had to hold the jug over your head and drink as it poured from the spout. There were no cups since the cups would end up in the water. It was no big deal but I liked having easy access to my own water. 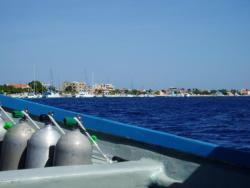 You could either dive air or nitrox while scuba diving Bonaire. There is no extra charge for nitrox. While there were usually enough nitrox tanks to go around, I could see it may be a problem if the place is full. You could get your tanks either down on the dock if you were going to dive the house reef, or up near the dive shop if you were going out for shore diving. You could pull your truck up to the the fill station so it was very convenient. I will say that scuba diving Bonaire lived up to its reputation as one of the best places to go scuba diving in the Caribbean. The reefs are beautiful, marine life plentiful (even if lacking in pelagics) and the diving pretty easy. We did 18 dives while we were there, 5 were boat dives and the rest were shore dives. We dove both in the north and the south as well as off Klein Bonaire. We also did the Town Pier night dive. In Bonaire, it is all about the freedom of shore diving (be sure to check out our page of Bonaire shore diving tips). 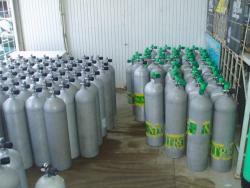 Just pack up your tanks in the truck, choose your dive site and you are good to go. Scuba diving Bonaire - doesn't get much easier. I would highly recommend picking up 2 publications to help you while you are scuba diving Bonaire. The first is, aptly, called "Bonaire Shore Diving" and is available free in the Bonaire airport. You will see racks of info, including this publication, next to the wall where you claim your luggage. Don't leave without one if you plan on scuba diving Bonaire. It has a map of all the dive sites as well as a short description of each site. It works really well in conjunction with the next publication. The next book I highly recommend is "Bonaire Shore Diving Made Easy" by Susan Porter. It is $17.95 including s/h and is well worth the money. Dive shops in Bonaire also sell this book and, if I remember correctly, our dive shop was selling it for about $10.00. However, you can't be certain it will be available when you arrive, so you might want to buy one before you go scuba diving Bonaire just to be safe. We consulted this book for every dive. It rates the dive (easy, advanced, etc. ), tells you the best entry and exit points, gives an overview of the topography of the dive site and tells you what you can expect to see or what to look out for. The one drawback is that it only has a map of the most southern dive sites. The other pamphlet I mentioned above (Bonaire Shore Diving) has a complete map of all the dive sites so you'll have everything covered while you are scuba diving Bonaire. The water temperature while were there was 84-85 degrees (Fahrenheit of course). It was great. I bought my shortie wetsuit but ended up just diving in my diveskin the whole time. You will need booties to do shore diving in Bonaire since the shoreline is rocky and uneven. I ended up buying open heel fins and booties before I went since I only have full foot fins. My husband, however, just bought a pair of water shoes and once in the water took them off, put them in his BC pocket and put on his full foot fins. 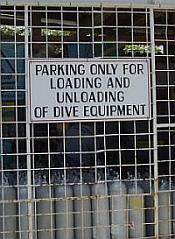 It worked fine for him but I wouldn't really recommend it while you are scuba diving Bonaire. Whatever you are comfortable with. The entries on some dives were a little more challenging than others but we didn't have any major problems entering or exiting. Just walk slow and look where you are going. The surf was pretty high a couple of days and added to the challenge but it was manageable. Once we got below, the waters were calm even if the surface wasn't. Dive sites throughout the island are marked with a yellow painted rock that has the dive site name in black. Just pull in and you're good to go. As you swim out over the reef, look for an unusual formation to mark your way back in. We would swim out, swim into the current (if there was any), go until someone hit half a tank and then swim back higher on the reef to the marked spot. On several dives, there was usually alot to see on top of the reef so you can also do alot of exploring during your safety stop in 10-20 feet of water. If you're not sure of your exit path, someone can always surface slowly and take a peek. You are not far from the shore so it's no big deal. The bottom line: Will I go back? Most definitely. I loved the island, the people, the ease of diving and the quality of diving. It is being added to our list of best places to dive in the Caribbean. Will I stay at Sanddollar condominiums again? Maybe, but not the next time. It is located right next door to Buddy Dive Resort where we went for a couple of meals. I liked the grounds and the amenities better at Buddy Dive. There are nice big docks and the dive boats were also more spacious. I have read alot of good reviews and will be giving them a try during our next trip. I'll let you know how it goes. 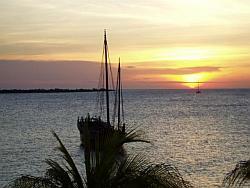 In the meantime, if you haven't been to Bonaire yet, I suggest you put it on your short list. I'm betting you won't regret it. Bonaire diving really is some of the best. I promise to use it only to send you Coco Zone Dive Club Newsletter.